Having autism can be a little like being a celebrity in that you hear a lot of things about yourself that even you didn’t know. What’s that? I’m pregnant? This is the first I’m hearing of it, though then again, I haven’t had my period in 25 years. One particular nugget that keeps popping up like a pimple the day before your first date in six months is that those of us with autism allegedly hate being around people. That socializing is a form of torture to us, like being water-boarded, or forced to use one of those 90s modems where you can grow old, die, be fossilized, and be discovered by Klingon archaeologists in the time it takes to load Google. The interesting thing about this particular assumption is that it’s not a cut and dry matter, but more of a double-edged sword. As always, I can only speak for myself; autism is an incredibly diverse condition, and I’m sure many people with it will disagree with my experience. But I’ve found that socializing is like exercise; it can feel great, and it’s good for me, but it’s also exhausting. Because socializing means paying attention to body language and expressions, and trying to manually decipher them. It means constantly running my brain at 110% capacity as I try to string together coherent and appropriate sentences. (And often slip up) It means having to absorb a flood of information, like watching a lecture on quantum physics played in fast forward. And if the onus is on me to drive the entire conversation, it feels like I’m Gandalf fighting the Balrog up the stairs from the water table to the top of that tower where the dwarves presumably kept their frozen peas and ice cream. Don’t get me wrong, I like it. After all, eating a whole pizza is also exhausting, but that doesn’t make it unappealing! From an outsider’s perspective, I guess it’s easy to mistake my mental exertion as me not wanting to socialize. But this isn’t the case; if anything, it gets a bit lonely sometimes, now I’m living away from home and not in a University dorm. Work helps alleviate this, but that’s a little like living on field rations when you’re craving the aforementioned pizza. So, contrary to what you might hear, people with autism don’t necessarily dislike the company of our fellow humanoids. We may find social contact challenging, but that’s not the same thing. Think how boring life would be if you didn’t do any of things you find challenging. Or, alternatively, think what life would be like without pizza. It wasn’t until recently that one of the reasons why occurred to me. More than just about any human character in the world of cinema, I could relate to Godzilla. In his long career he’s changed from villain to hero and back again so many times that it’s like he’s the lovechild of a tyrannosaur and a traffic light, but the version of him I liked best was the misunderstood one. This Godzilla wasn’t so much a 50,000 ton nuclear bulldozer on legs, so much as a lonely being who didn’t know how to interact with the world around him. He couldn’t communicate with people, so he didn’t realize that smashing that pesky bridge out of the way was frowned upon. Most of the damage he did was by accident, which to me recalled the motor function and spatial awareness challenges that can come with autism. I myself can hardly go a day without tripping over a cord or knocking something over; I even sat on a birthday cake once, though in my defense, it was on a couch. Every time, mankind tries to deal with the problem ourselves, fails dismally, then socially awkward Godzilla saves the day with his special talent for knocking other monsters silly in sequences that often resemble a match of Super Smash Bros played in slow motion. Humanity then goes back to treating him like a leper with smallpox once they don’t need him anymore; another sadly relateable scenario. As someone on the autism spectrum, I felt Godzilla was a kindred spirit. But it’s not all boom and gloom; in spite of the government never seeming to learn that Godzilla’s not a villain, the main characters often do. More than one film ends with them heart-warmingly waving goodbye to him as he returns to the depth of the ocean to enjoy his peaceful Aspie alone time. Here’s a sobering statistic: 66% of adults with autism in Australia are unemployed, compared to 6% of the general adult population. In other words, only one in three has a job, and we are eleven times less likely to have a job compared to our non-autistic counterparts. People often ask me if I work, often with the thinly veiled implication of “you’re not one of those dole bludgers are you?” lurking just beneath the surface like wasabi (AKA Green Napalm) hidden under the fish in a roll of sushi. For me, the answer is yes… and no. I currently work as a writer, facilitator, mentor, and young adult’s group assistant for the I Can Network, as a reviewer for a cinema website, and as a deliveryman for Meals On Wheels. However, the first and third are volunteer positions, (so far anyway; the I Can Network is growing fast!) and the second won’t see me buying Wayne Manor or starting my own space program anytime soon. So, like many Australians on the autism spectrum, I rely on Centrelink to pay the rent and feed myself. There, I said it. I actually felt quite a bit of guilt about getting paid without working while so many of my friends busted their arses in day jobs, so after finishing University I sought out volunteer work; I wanted to give something back while I searched for paid work. My three part-time gigs don’t quite add up to full time work, but they make me feel useful, which is a more potent antidepressant than any meds I’ve ever taken. I am working towards a job that I can live on, and as soon as I can land one, I intend to get off Centrelink and never go back. What’s most disappointing about the 66% statistic is that some of the greatest writers, thinkers, and problem solvers I know have autism. Yet in spite of their remarkable skills and razor sharp intellects, many of them are unable to find work. It’s not just a loss for them either, but also for employers and the economy; as a country, we have this enormous reservoir of talents going to waste. As with many a social problem, education is key part of the solution; employers need to be taught the potential benefits of having an employee on the autism spectrum, like an encyclopedic knowledge of their profession. This is one of the key long term goals of the I Can Network. The more I work with the Network, the more I impressed I am by how much people with autism have to offer. Having two thirds of them out of work does everybody a grave disservice. The I Can Network’s first camp: great success! As I’ve mentioned in previous posts, I’m a member of the I Can Network; an NGO that works to support people with autism. We focus on empowering and enabling, promoting an “I Can” rather than an “I Can’t” mentality. 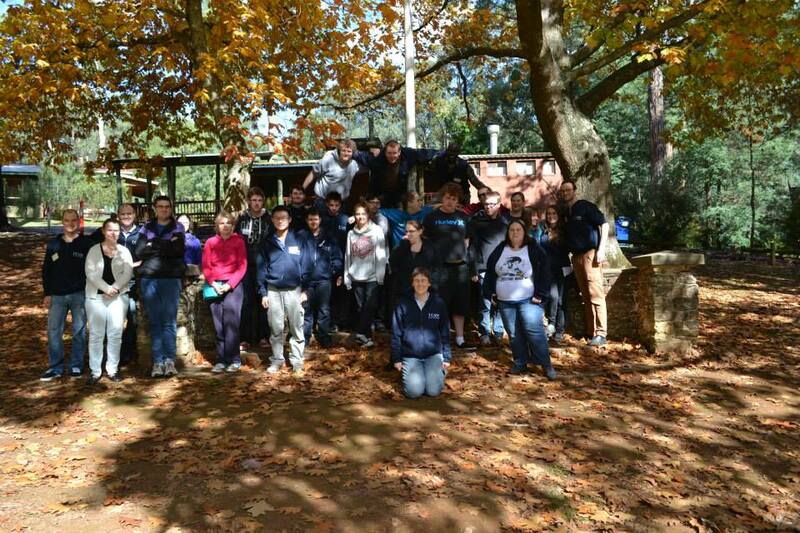 From the 25th to the 27th of April, we ran our first camp for young adults with autism, at Gembrook, outside Melbourne. In addition to our core team of facilitators, more than thirty people took part. Organizing and running the event was a gargantuan undertaking. First of all, we had to feed everybody, including those with allergies and intolerances. Carting four trolleys overflowing with food out of the supermarket, we must have looked like doomsday planners preparing for World War 3, or the invasion of the carnivorous Brussel Sprouts from Jupiter. Then we had to make sure everybody made it to the camp; easier said than done, as it was in the middle of nowhere, with no phone reception. Some of the camp facilitators actually had trouble finding it! It was a challenge, but our amazing facilitator team rose to meet it, and the end results were absolutely worth it. What was strikingly apparent throughout the three day program was the remarkable spectrum of talent on display. Highlights were numerous and wonderful, from a non-verbal man who could express himself with incredible eloquence via a keyboard, to a passionate impromptu duet of the song “Let it go”. But perhaps the best part of all was the acceptance and support people showed each other. I left the camp with a dozen more friends than I had when I arrived, and I’m wasn’t the only one. At one point, when I was preparing a meal, one of my co-chefs cut their finger with a knife; the blood gave me an immediate panic attack, and I went to bits like a gingerbread man in a blender. So many people pitched in to try to make me feel better, and not just my colleagues; I’ve never felt so supported in my life. It was truly something special. It may not have been a completely smooth ride, but on the whole, the camp was a resounding success, and will hopefully be the first of many for our organization.